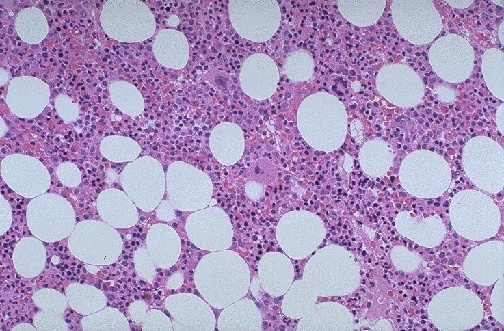 This is the appearance of normal bone marrow at medium magnification. Note the presence of megakaryocytes, erythroid islands, and granulocytic precursors. This marrow is taken from the posterior iliac crest in a middle aged person, so it is about 50% cellular, with steatocytes admixed with the marrow elements.